Readership numbers for the venerable Overgrown Path are proving remarkably resilient. 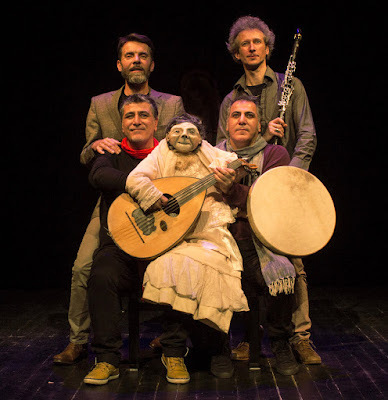 One outstanding example of this resilience was the recent post which brought together the eminently un-clickbaitable components of a Sufi poet, Pauline Oliveros' teachings on the art of listening and an album featuring the Tunisian oud player Fadhel Boubaker. The readership rankings of posts in the sidebars to the right of this article are driven in real time by the blog software, and as I write 'It's about how we listen and not where we listen' is not only the most widely read recent post, but has also attracted the largest readership of any post in the last 12 months, despite having only been available for two weeks. Which is food for thought for those experts who tell us that Mahler with a celebrity conductor is the only way to attract an audience these days. One common factor linking this recent run of popular posts has been that they have all featured musicians from the Islamicate world - French-Syrian Abed Azrié, Iraqi-American Rahim Alhaj, British Muslim Ali Keeler, and Tunisian Fadhel Boubaker, and another disturbing reflection of the world we live in is that two of those musicians - Abed Azrié and Rahim Alhaj - are living in exile and, moreover, one of them - Alhaj - was the victim of politically-motivated torture. It is a sad fact that over the years despotism and humanitarian outrages have been the catalyst for important music, and that is true of the Middle East today. Yet another example of this important music is Zyriab from genre-busting Bab Assalam. Back in 2009 I featured Bab Assalam's first eponymous album in a post perspicaciously titled 'Music as the last bulwark against barbarity'. In 2009 Bab Assalam comprised the the Syrian brothers Khaled Al Jaramani and Mohannad Al Jaramani on oud, percussion and vocals, and clarinettist Raphaël Vuillard, and the album was recorded for the tiny French label Ad Vitam in the ancient Syrian city of Aleppo. 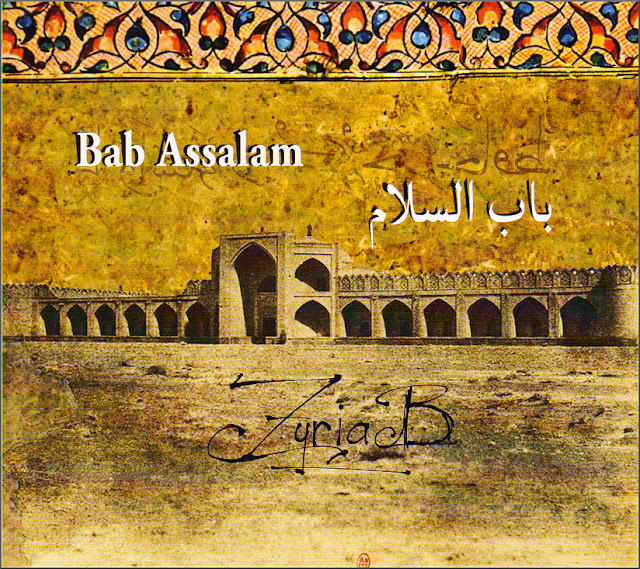 In the six years between Bab Assalam's first and second album much - in fact far too much has changed - has changed. Aleppo has been devastated in the terrible Syrian war and the Jaramani brothers are working in exile in France. And reflecting a seismic shift in their music, to the acoustic trio of the first album has been added the electric guitar of Philippe Barbier, while Raphaël Vuillard adds electronics to his role as clarinettist - see footer photo and this video sample. Metaphor is a key tool in the teachings of Sufism, and metaphor informs the narrative and style of Zyriab. The album is a musical narrative depicting the journey of the 8th century musician, astronomer, fashion designer, gastronome and all-round polymath Zyriab. He was born in Iraq in 789 (either in Baghdad or Mosul) and is thought to have been of racially mixed African-Arab descent - his black colour is probably reflected in the name Ziryab which translates as 'blackbird'. After training to become a highly accomplished musician Ziryab was forced into exile, travelling to Syria and then Tunisia. He finally settled in Córdoba in al-Andalus (Moorish Spain) where he pioneered the five string lute and established one of the first schools of music, which was notable in that then Muslim city for accepting both male and female students. In Córdoba he laid the groundwork for the development of the Andalusian style of music that today remains the classical tradition of Arab music in North Africa. Stylistically Bab Assalm's first album was acoustic and infused with Aleppo's spiritual positivism, while the new album, which is released on their own label, is angry, conflicted and infused with the tragedy that has taken overtaken Syria and the surrounding regions. In Ziryab tantalising flashbacks to the mellifluous style of the band's first album underline the descent from peace into never-ending conflict, while Hendrix-like electric guitar riffs juxtaposed against plaintiff chords on the oud speak of the same things as Holst's Mars and the timpani battle in Nielsen's Fifth Symphony. Bab Assalam's Zyriab is brave and important music that is as relevant - if not arguably more relevant - to our present predicament as a Mahler symphony. It deserves to be heard. One tendency that worries me is the Procrustean bed of the mass media. Gruesome event takes place in London. Perpetrator converted to Islam. Therefore this is Islamic terrorism. This is a very lazy syllogism that takes the individual responsible out of the equation to pin the blame squarely on another culture. Countervailing signs, such as the man was not stable, are ignored. But we get the same in reverse when people who voted to leave the EU are derided as numbskulls. I voted to leave a political bloc conducting disastrous economic policies against Southern Europe in order to fulfil the dreams of Bismark. I suspect you might have been on the EU side but.... Why do governments need to be control what is in a bottle of wine, a jar of jam, a band of musicians? When does an overpowering supra-national power need to be invoked for me to buy Spanish oil, listen to Austrian music, enjoy a Hungarian spa? It does not unless the functionaries need to be paid for doing something. Unless it is to ram through the construction of another cathedral of old music, such as Rattle desires? Common factors linking the popularity of your posts are your insightfulness, quality writing, and (occasional) well-aimed acerbity. Glad you stick with it.